A little tip for those who need a multiple amount of small flowers or leafs on their clay journal or other artwork! I looked at Etsy stamps in metal for £9 each... Then I looked at my clay and my hands and said: "Let's do it!". Took me 25 minutes to make and bake.. But then I was stamping away with a speed of lightning and I saved some money! 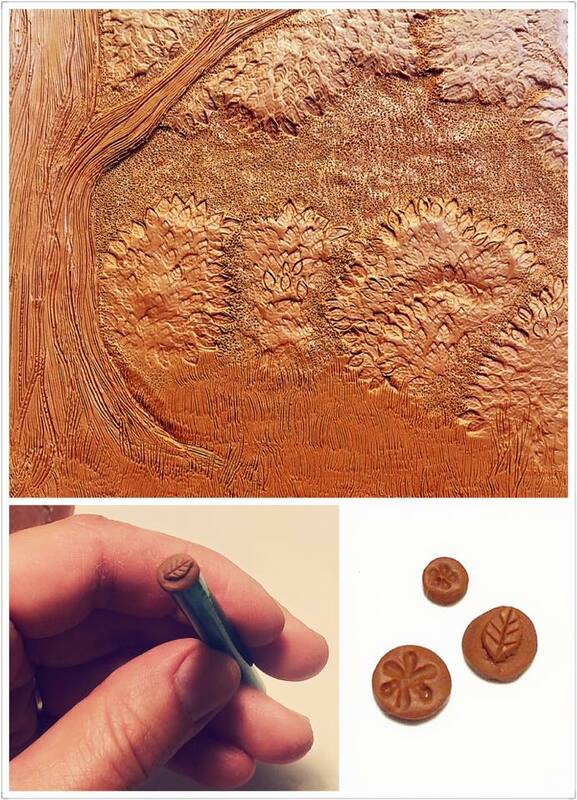 You can make flowers, leaves and all sorts of other mini impressions with these. The picture shows the nature picnic scene and I needed a lot of leafy bushes and trees. So it worked very well. YOU can make some smaller and bigger ones to add the variety and more dimension. I glued my stamps with super glue to an old pen bottom part, but if you like you can use sticky glue dots to attach and detach multiple stamps onto one pen. Anyways, this adds possibilities and new looks to my artworks and I couldn't just skip this without sharing.